The Marlborough Medical Center offers comprehensive outpatient, emergency, radiology, laboratory and rehabilitation services to the communities it serves. At the Middlesex Health Marlborough Medical Center, our team of physicians, nurses and staff dedicate themselves to providing the best care and service possible. We are proud to have received the prestigious Press Ganey Summit Award for nine consecutive years of over 95% patient satisfaction—the only emergency department in the United States to be recognized for this achievement. Recently, we’ve taken our commitment to patient satisfaction to a whole new level with our innovative new SmartER program. Using SmartER, you can now schedule an Emergency Room appointment in advance—so you’ll spend less time in our waiting room and more time in the comfort of your home. Our expert staff uses the latest technology to offer a wide range of services, including 24/7 emergency care, advanced diagnostic imaging (including CT, MRI and digital mammography), outpatient laboratory services, pre-operative testing and more. Monday through Friday, 7:00 a.m. - 6:00 p.m.
Monday through Friday, 7:00 a.m. - 7:00 p.m.
Our board-certified physicians and clinical personnel provide a full complement of emergency services, 24 hours a day, seven days a week. And for an added level of convenience, our SmartER program lets you schedule an emergency room appointment in advance, so you can cut down the amount of time you’ll spend in our waiting room. We have 12 emergency treatment rooms—with two dedicated to critical patients—and our facility also features isolation and decontamination areas, plus a helipad on site for LIFE STAR medical helicopter transports. Middlesex Health paramedics provide critical treatment in the field, working alongside fire and EMS personnel throughout its service area. The Middlesex Health paramedic service is one of only three such hospital–based services in the state. Middlesex Health paramedics provide emergency medical services to the towns of Marlborough, Colchester, East Haddam and East Hampton, 24 hours a day. Being able to provide these services before a patient in critical condition gets to the Emergency Department is extremely important. Paramedics receive special medical training that enables them to provide an advanced level of emergency medical services. Full-service, on-site, outpatient laboratory in a convenient setting, including Pre-Operative Testing. Mammography: Technology-certified mammography by the American Registry of Radiologic Technology produce 3 Dimensional images of the breast, which are read by board-certified radiologists. Open and Closed MRI: Magnetic Resonance Imaging (MRI) uses magnetic fields and radio waves to produce accurate anatomical images that, when aided by a computer, can be viewed from any different angles. Ultrasound: High-resolution duplex color Doppler ultrasound uses sound waves to look inside the body, and is frequently used for monitoring fetal development. Technologists certified by the American Institute of Ultrasound and Medicine. Tele-Radiology: Advanced digital technology makes real-time consultation possible between radiologists at Middlesex Health and the Marlborough Medical Center, 24 hours a day. Digital Fluoroscopy: An X-ray based technology that can assess an organ or body in real time. Typical fluoroscopies include gastrointestinal or barium GI) studies. High Speed Multi-Slice CT Scan ("CAT" Scan): CT scans use a computer to enhance X-ray type images. Typical CT scanners create image slices one at a time; our machine creates two images at the same time. Images are then assembled into a very detailed, three-dimensional view. An x-ray exam of the blood vessels, this procedure is performed to help doctors identify diseased, narrowed, enlarged, and blocked vessels, and to determine where internal bleeding may be occurring. A bone density scan, along with a patient's medical history, is a useful aid in evaluating the probability of a fracture or osteoporosis and whether any preventative treatment is needed. 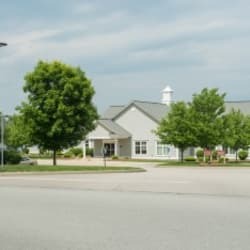 Located near the Medical Center in the Marlborough Tavern Green, the Physical Rehabilitation office is a resource for creating customized programs to speed your recovery. Middlesex Health Physical Rehabilitation is a multi-faceted program that includes inpatient, outpatient and Care at Home services. Patient care is delivered within the scope of practice of the licensed professionals who make up the Physical Rehabilitation team. These include physical and occupational therapists, assistants, and speech language pathologists. Middlesex Health Marlborough Medical Center is located at: 12 Jones Hollow Road, Marlborough, CT, 06447 Copy address to paste into Text, Email, App of choice.